Most of the internet marketing start-ups focus all their attention on building website, designing nice graphics, and creating products. They have even spent a few months to a year just preparing how to boom as an internet rookie rock star. But, they neglected a very important piece to build - A mailing list. This is difficult because you have no concrete idea of how list building actually works. You spent time on doing research, paying for clicks and lead generation campaign. But the list is still lacking. This is why you think list building is difficult and complicated. This training course is a series of 20 videos teaching you how to create a list without expensive costs and high end software. In this quick video we'll show you how to sign up and register for an Aweber account. Aweber is one of the leading autoresponder services for online marketers. Watch as we show you where to click, what options to choose, and how to get started. In this video we'll show you how to sign up and register for a GetResponse account. GetResponse is another popular choice for online marketers. Watch as we show you how to setup your account details and get you started. A listname in Aweber is a way for you to keep all your subscribers, prospects and customers in one place. Once you've created your listname you can then add follow-up emails and send out broadcasts individually. A campaign in GetResponse is a way for you to keep all your subscribers, prospects and customers in one place. Once you've created your campaign you can then add autoresponder emails and send out newsletters. The sign up form, also known an opt-in form is simply a piece of code which is placed on your website or squeeze page or exit pop-up to allow people to sign up to your listname in Aweber. It usually consists of two text fields for the name and email, and a submit button. Watch this video to see how it's done. The opt-in webform, also known as the signup form is simply a piece of code which is placed on your website or squeeze page or exit pop-up to allow people to sign up to your campaign in GetRepsonse. Watch this video to see how we create the webform. In this example we'll be using a WordPress plugin called Optimize Press to show you how to create a simple yet effective squeeze page that displays your sign up form. This is the foundation for building a mailing list. Once you have made it this far, you are well on your way to building a profitable list. A 'thank you' page is simply a place to send your new subscriber, prospect, or customer to as soon as they've subscribed. This can also be a confirmation page asking your subscriber to confirm their opt-in or you can send them directly to the content promised on the squeeze page. Exit pop-ups are another excellent way to build your list and are ideal for blogs. As soon as a visitor lands on your page, a pop-up will appear asking them to sign up to get more information on your site. With a simple piece of embedded code you can build your list for free. Owning a mailing list is a monthly expense. The more leads you have, the more it will cost you. Even though you've got subscribers, not everyone on your list will be reading your emails so it's a good idea to remove unresponsive subscribers to minimize costs. Watch this video and we'll show you how to do this in Aweber's system. Owning a mailing list is a monthly expense. The more leads you have, the more it will cost you. Even though you've got subscribers, not everyone on your list will be reading your emails so it's a good idea to remove unresponsive subscribers to minimize costs. Watch this video and we'll show you how to do this in GetResponse's system. If you're a product creator, it's always a good idea to get affiliates in on the action. Not only can they make you money but they can build your list too! In this video we'll show you how to build an affiliate page that invites people to promote your offer. New products are launched every day in the internet marketing sphere. And where there's a launch, there's traffic! Having your banner placed on the download page of fellow marketer is a surefire way to get quality buying traffic added to your list. Watch this video to see how it's done. How do you know what headline to use? How do you know what font works best? How do you know where colour your submit button should be to get the most opt-ins? The answer is you won't know until you start split-testing your pages and know your conversions. VWO, also known as Visual Website Optimizer, is an online marketing tool that lets you fine-tune your marketing process so that you're getting the most from every visitor that comes to your site. Watch this video and we'll show you how to use it. An A/B split test lets you compare two variations of a similar page side by side. When you promote your squeeze page for example, 50% of the traffic will go to version 1, and 50% of the traffic will go to version 2. Once you know which version performs the best, you take the winner and put it up against another variation. Watch this all important video to see how it's done with VWO. There are two main ways of getting traffic. The free way and the paid way. The free methods are usually slow and for the long term whilst paid advertising is fast and instant and let's you see how well a campaign is performing. In this video we'll show you how to start your Facebook Ad Campaign. YouTube is the 2nd most popular site on the web right after Google so it make perfect sense it use it as a source to generate traffic! In this video we'll show you how to add a 'call to action' overlay on your videos to get people to your website. There are two paid advertising methods in YouTube. One is through In-Stream ads and the other is through In-Display ads. Watch this video as we walk you through the process of submitting an ad, adjusting your budget, knowing how many impressions you'll get and more. With AdWords you pay for every click on your ad. The number of clicks you'll get is determined by the quality of your ad, the relevancy to the audience and how much you're willing to bid on specific keywords that you want your ad to show up for. With a well optimized ad campaign, website and sales funnel you can turn this into a permanent source of traffic and a highly profitable online business. 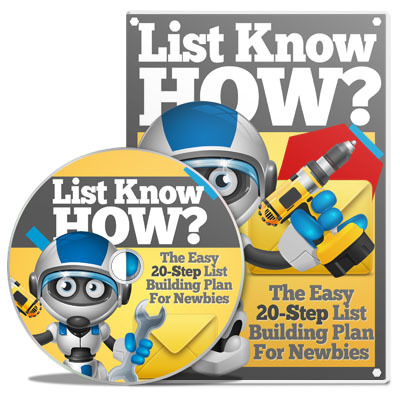 List building has never been so easy if you follow my course closely. You're getting access to the videos as a mean of teaching so that you will have a clear visual of what you’re learning. If you ever have a tiny problem which stuck your way to build a list, this will be the cracker to your problem. List is important for start-up (if you’re one, you definitely need this!). Again I should emphasize this: No list, no profits. This course is the fastest and simplest way to build your list without going through hard time of researching. If you ever bought a similar training course like this, you will find that they are hard for you to digest because of a lot jargons involved and the author beat around the bush. You need to take time to catch the hints and probably you need to go through it a few more rounds to catch the whole idea. List Know How changes all this so you're building your list as soon as TODAY without confusion! Act Now And Receive 11 Freshly Written PLR Reports With Sales Pages! These are high quality private label niche reports that will add value to your email marketing campaign. Each one comes with their own sales letter, high resolution cover graphic and source document. Take any of one of them, brand them, make them your own and you'll build a strong following of readers who'll know, like and trust you and in no time! List Know How is not just a bunch of alleged theories and assumptions. In fact, the methods and approaches are tested to be effective to build a mailing list across multiple niches. Moreover, these are also exactly the same steps I took to build my mailing list. Click the order button below to secure your order. YES Charles! Give me instant access to List Know How! I want to know the secrets to building a massive mailing list with tens of thousands of subscribers and hundreds of fresh new leads every day! We make every effort to ensure that we accurately represent these products and services and their potential for income. Earning and Income statements made by our company and its customers are estimates of what we think you can possibly earn. There is no guarantee that you will make these levels of income and you accept the risk that the earnings and income statements differ by individual. As with any business, your results may vary, and will be based on your individual capacity, business experience, expertise, and level of desire. There are no guarantees concerning the level of success you may experience. The testimonials and examples used are exceptional results, which do not apply to the average purchaser, and are not intended to represent or guarantee that anyone will achieve the same or similar results. Each individual's success depends on his or her background, dedication, desire and motivation. There is no assurance that examples of past earnings can be duplicated in the future. We cannot guarantee your future results and/or success nor is this a guarantee of ways to make money online. There are some unknown risks in business and on the internet that we cannot foresee which can reduce results. We are not responsible for your actions. The use of our information, products and services should be based on your own due diligence and you agree that our company is not liable for any success or failure of your business that is directly or indirectly related to the purchase and use of our information, products and services. ClickBank is a registered trademark of Keynetics Inc., a Delaware corporation. List Know How is not affiliated with Keynetics Inc. in any way, nor does Keynetics Inc. sponsor or approve any List Know How product. Keynetics Inc. expresses no opinion as to the correctness of any of the statements made by List Know How in the materials on this Web page. 2019 List Know How. All Rights Reserved.